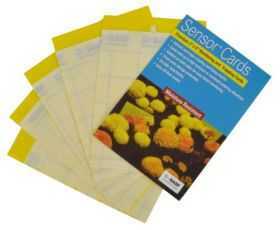 Featuring superior, Posi-Trap glue, these durable, long-lasting pest monitoring and trapping cards are designed to catch a variety of pests, including winged aphids, leafminer adults, thrips, whiteflies, fungus gnat adults, shore flies, fruit flies, leafhoppers and other flying insects. The 3 in x 5 in Sensor Cards are packed in poly-bag and coated on both sides with non-drip glue that will not stick to skin. Sensor Cards also feature non-sticky edges for easier handling.